Strengths: A half-screen command grab that leads to a hard knockdown is what every grappler dreams of, and Thunder has it. When he manages to get past your attempts to keep him away, he can threaten with grabs from multiple ranges, and he has a collection of nice special moves to catch people who try to evade. Thunder's DP comes equipped with multiple followups, which he can use to move around the screen and attempt to hit an opponent ready to punish. Highly damaging combos to complement a highly damaging grab means any correct read will hurt. Weaknesses: Slow walk speed and a floaty jump make Thunder struggle against some strong zoners, although he has a good forward dash and his instinct mode to circumvent some of the standard grappler woes. In general, Thunder wants to be close to you, and if you can make that difficult for him, you can frustrate a Thunder player. Notes: Thunder's damage is very high after a counter breaker, especially the no-meter version which is the second highest in the game only to Mira. During regular play, if you counter break in the middle of a combo instead of after just one move, you can expect this damage to be well into the high 70%s if you use both stocks of shadow meter. Thunder's light Ankle Slicer linker is the only choice, since Triplax and higher strengths of Ankle Slicer are much slower. There is a version of the 1-meter combo that uses shadow Ankle Slicer instead of the shadow ender for the same damage, but shadow Call of the Earth lets you juggle for more damage and also causes a hard knockdown for setups, so it is vastly preferred in this very specific combo. However, if you see a non-counter breaker lockout in the course of regular play, know that throwing shadow Ankle Slicer in your combo to quickly increase the ender level is a great use of meter. Both these moves are largely safe on block. Triplax moves Thunder forward and is a great move to catch people trying to jump away from command grabs, because it hits quickly. Be careful, though, because Triplax can be easily shadow countered; it always hits at least twice, and shadow counters are fast enough to interrupt any hits past the second hit. If you can train yourself to press shadow counter as soon as you see Thunder turning around at the start of Triplax, you will have success stopping this move. Shadow Triplax has one hit of armor, even when used as a shadow counter, so you can blow through some predictable pokes and start a grounded combo. Ankle Slicer is a low attack that crushes lows and swings Thunder backwards before he lunges forwards, avoiding some attacks. It's useful to catch people trying to backdash or otherwise walk out of range of Thunder's pressure. Lastly, back throw counts as an opener; as Thunder's combo trait, it is directly cancelable into doubles and linkers. To start a combo on the ground, Thunder sticks with his standard openers. However, if he lands shadow Call of the Earth, or a Sammamish and then uses the Skyfall followup, he will be able to do a brief juggle combo. Typically, Thunder players will use a flipout attack here for a quick reset, or they will attack with some normals and special moves to build up some extra white life so the next opening leads to a bigger cashout. Ankle Slicer is a fast, damaging linker but the higher strengths are easier to break, since Thunder winds up for multiple swings. Shadow Ankle Slicer completes its five hits very fast, which can make lockouts hurt for two bars. Triplax is one of the few linkers that hits 2, 3, and 4 times for light, medium, and heavy, so be on the lookout for that. Back throw is also a linker (again, Thunder's combo trait), which means you can do two back throws in a row (as an opener, then a linker), and all manuals are possible after back throw. Back throw can be teched while in a combo using LP+LK, but the timing is as tight as breaking a light manual and the throw comes out with linker timing (which is much earlier than a light manual would occur), making it difficult to defend against. Shadow Ankle Slicer is prohibitively easy to break, since it has no lockout gaps, as long as you wait for Thunder to lunge towards you during the 9 frames after the freeze. Like other shadow linkers of its kind, the only mind game at stake is whether the Thunder player will counter break or not, since you are unlikely to be locked out. Shadow Triplax has a decent delay between the freeze and the first hit, but when breaking in practice, it feels much earlier than that because the 6 frames will play out while the camera is moving back to a neutral position. You need to strike the first hit right as the camera completes its reset, which makes it feel like you're breaking almost directly after the freeze. The timing is slow compared to other medium-rhythm shadow linkers like Sadira's Shadow Blade Demon, but it is perfectly in rhythm with Thunder's grunts as he swings for each hit. If you're struggling catching the first hit, you can try breaking on hits 3, 4 and 5 to ease the difficulty. Ankle Slicer will build Thunder the meter he needs to be threatening with shadow Call of the Earth, so it's the recommended ender to use early in the fight. Otherwise, Thunder's damage enders are good choices to use. see the two Call of the Earth enders being used. Regular Call of the Earth is strong damage but can be quick rised so the fight returns to neutral, while shadow Call of the Earth either acts as a hard knockdown if you don't followup with a juggle, or gives a reset opportunity in addition to strong shadow damage. Triplax ender has situational uses, but Thunder's floaty jump hinders some of the traditional wall splat mixups, so Thunder will have to use backdash or other tricks to bait throws here. Sammamish as an ender is both a launcher and a hard knockdown, so you can choose to charge a Call of Sky buff and still have time to apply ambiguous offense here. While Thunder cannot recapture, he makes excellent use of flipout. There are many opportunities to use standing LK to cause flipout, including after shadow Call of the Earth (both in neutral and as a combo ender) and his Skyfall stomp followup to Sammamish. Surprise Knee, which is his LK followup after Sammamish, acts as a flipout immediately, so if you catch someone with Sammamish, you don't have to do Skyfall into standing LK flipout if you choose not to. This gives Thunder options to avoid predictable break patterns and still cause flipouts. After a flipout, Thunder has tons of scary options. Mix it up between Horn Breaker overhead, low attacks, Call of the Earth grabs, and if you are in instinct, dash through mixups. Your opponent will have to make a difficult read to avoid taking damage after Thunder's flipout. Thunder's body surges with electricity as he gains a fast, invincible forward dash which can be canceled off the opener version of Triplax and Ankle Slicer (and also the Skyfall stomp, if the opponent blocks it), goes through opponents, and leaves a cloud of black crow feathers behind him, strongly disguising his movement and confusing the opponent. This will help Thunder close the gap on a zoner or avoid a predictable mid-range poke and leave Thunder at his optimal range, and it also provides Thunder with extra mixups on his grounded special moves if they are blocked. If you predict Thunder's dashing here, you have a brief window to interrupt it, but it is fast and difficult. The dash itself has some vulnerability at the end, so Thunder needs to use them with caution in the mid-range or from full screen to avoid running into attacks. If Thunder activates instinct on his own wakeup and notices the opponent has committed to an action, he can use forward dash's invincibility to get behind the opponent and punish. Thunder has a 2-hit command overhead, called Horn Breaker, with +HP, which goes very far and is good to catch people who panic at the edge of Thunder's command grab range, but good defenders will be ready for this option and shadow counter after the first hit on block. Otherwise, Thunder can keep people who try to jump away from command grab with normals like close LK, which if canceled into heavy command grab on block will create a dangerous tick throw option, and will cause flipout if the opponent jumps. Far standing HK and HP are also great buttons that can be canceled into heavy Triplax opener if your opponent chooses to sit at this range long enough; HK causes Thunder to stand on one foot and lunge forward, dodging some low moves, and HP is a little slow at 10 frames of startup but takes up more than 3 character lengths of space in front of Thunder. Jumping MK and HP have cross-up potential, with jumping HP being Thunder's bread winner; it has massive active frames and a hugely ambiguous hitbox, and it sets up nicely after shadow Call of the Earth. As is always the case with grapplers, the Call of the Earth command grab is scary. All versions are throw invincible, and HP has over half-screen range, but they're a little slow out of the gate at 10, 13, and 17 frames of startup for light, medium, and heavy. That's not so bad, though, because that allows Thunder to tick into them, and the command grab range really can't be understated. Shadow Call of the Earth is the real star here; at just 5 frames of startup before the freeze and 0 frames after, and almost the range of the HP version, dealing 20% unbreakable damage with follow-ups possible, this move will terrorize opponents who are anywhere near Thunder. This move works well in conjunction with Thunder's excellent dragon punch, Sammamish. All versions of Sammamish are projectile invincible, which gives Thunder an option against some zoners, and they are also upper body invincible, useful for anti-air and certain approaches. Thunder has three different followups to any Sammamish, whether it hits, whiffs, or is blocked. Use Surprise Knee (LK) if you want to cause a flipout and do a fast mixup, or use Skyfall (HK) if you want to stomp on top of somebody's head. You can delay Skyfall and make it a crossup in some situations, and also mess up punish attempts on the shadow version. Dropkick (MK) will keep Thunder's horizontal momentum if pressed early enough, which gives him a way to fly across the screen quickly and attack some zoners. Be careful, though, as all followups are very unsafe on block. Shadow Sammamish is completely invincible, making it Thunder's primary reversal option; without meter, Thunder must either backdash or block on his wakeup, as none of the regular Sammamish versions can avoid attacks that hit Thunder's waist or below. Thunder also has Call of Sky (PPP), a special move that calls a bolt of lightning down to strike Thunder and power him with lightning, giving him access to a single-use invincible instinct dash. Call of Sky is slow, but Thunder gains access to the dash nearly instantly (on frame 13) and keeps it even if he gets hit, so it can be useful as an approach through powerful zoning moves or to power up your mixup game after a knockdown. The Call of Sky lightning bolt can also destroy projectiles for a brief period of time when it strikes Thunder, but the window is short. The one-time-use instinct dash automatically expires after 10 seconds if not used. Thunder's main strategy is to get people to sit still, so he can give them a giant hug. Doing this is not necessarily easy, however, which is why, like most grapplers, the command grab is not something you'll use every time you're close. Most of Thunder's pressure will be with Ankle Slicer and Triplax, and using some beefy mid-range normals to convince people that jumping is bad, and then surprising them with a quick forward dash into shadow Call of the Earth. 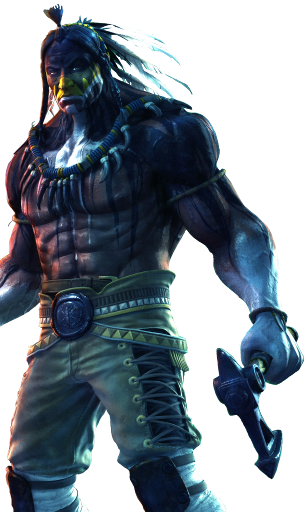 If you are new to KI from other fighting games, you will be continually amazed at how far reaching Thunder's shadow Call of the Earth is. Thunder's Ankle Slicer battery ender is particularly important, since having meter available makes Thunder a much more pronounced threat; if you have bar already, use his other enders such as Sammamish or Triplax to apply mixups, such as jumping HP cross-ups, tick grabs, empty jump lows, and empty jump grabs. Or, you can use Call of the Earth ender to earn big damage and go back to neutral. For reversals, Thunder can really only use shadow Sammamish, but when your opponent is anticipating this reversal, bring out the shadow Call of the Earth to make him really frustrated and scared to approach a knocked down Thunder. If you're getting zoned out, use Sammamish to avoid projectiles; if the zoner is particularly troublesome, use the Dropkick followup to fly across the screen and try to knock him down, but this is risky if it misses or is blocked. You can also inch your way forward with forward dash, or use Call of Sky situationally to get you closer. If you're really struggling, activating instinct should get you the rest of the way there. Show me an arachnid assassin.